Home / Knowledge Base / General Information About Email and SMTP / What is SMTP? After the sender composes an email message and hits 'send', the message leaves the sender's mail client's outbox. Its first stop is the sender's outgoing SMTP server (e.g. smtp.ultrasmtp.com). 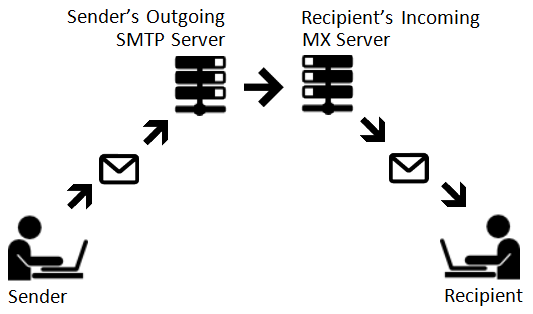 The sender's outgoing SMTP mail server then attempts to deliver the message to the recipient's incoming mail exchanger (MX). If everything goes well, the recipient's incoming MX server accepts delivery of the message. Finally, the recipient's mail client picks up the message from their incoming MX server, and the recipient receives the message. Why do Legitimate (non-spam) Email Messages Sometimes Not Reach Their Recipients?